Page Panel: Used to create, edit, clone or delete pages. Item Panel: Shows when you select an item on the canvas. It is used to edit item properties. This panel appears whenever you click an item on the canvas. Page Tile: Click the title to type in your page title. Product Width / Height: This is used to define the final width and height of the printed PDF file. In a plain design like Business Card, Flyers, Stickers etc, this is the real dimension of the design area in physical units. Not Pixels. Page Index: This allows you to insert a page in between existing pages. So by default, it should be 1. If you have other pages and you want to insert a page before page 3 for instance, then you should enter 3. So your new page becomes page 3, pushing the rest further. Bleed Lines: A single bleed value can be provided and will be used to demarcate cut lines. Kindly note, the bleed is part of the final design size here. So if you have 10cm x 12cm with a bleed of 0.5cm, the final PDF will still read 10cm by 12cm and take off 0.5cm on all edges and place the cut marks there. Margin Lines: This shows similar to the bleed line but is shown as a solid line and not used for cuts. Vertical and Horizontal Fold Lines: These are simply lines drawn on the design canvas to guide your users of folding portions within your design. For instance, if you are designing a greeting card, such could have a horizontal line depicting where the card will be folded, but will never be printed in the final PDF file. You can provide as many fold lines as you want by using comma to delimit each. No spacing, just comma. Page Thumbnail Image: There are places where the design preview is required, like on your product page. By default, we normally use the design preview but this gives you the option of setting a different picture to be used for previewing each page. Click the Make Page button to add the new page to your design. Width, Height, XPos and YPos: This gives you the basic property of the selected item. You can click the padlock icon to lock the width / height ratios while editing. Label: This is the title that's displayed for the item when a form is displayed for this design. It can also be used to pre-populate a text value with the user data when the app loads. These values are supported by default: Email, Phone, Address and Name. For example, if you have a text on the canvas and you gave it a Label "email", when that design loads on the product and your user is logged in, this text will be automatically filled with the user's email address. If the user is not logged in, we will just display the value you have provided. 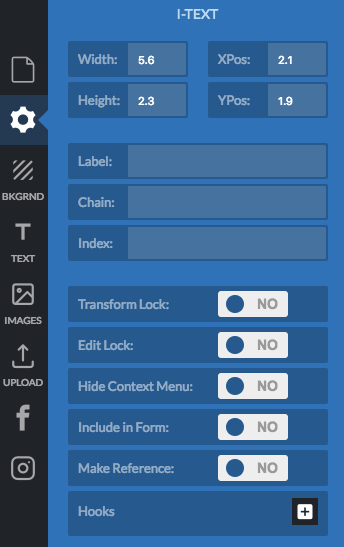 On a form, this is used as the label as shown below: Name, Title, Phone Number, Logo etc are each Labels assigned to different text elements..
Chain: The chain value is used to link text and photos together so they share the same value. For instance you have several email elements on the canvas, if they all have the same chain value, when one is edited, the remaining ones also get their values updated. Same with photos. Kindly note, this is different from the Label. You can come up with any value for a chain but they must be exact and are case sensitive. You can have multiple chains separated by comma and no spacing. Index: The index value is an integer that allows you set the display hierarchy of items in a form. Every item has a default index value of 0. So you can have a positive or negative value. Items with higher values will be displayed first. In the form displayed above, Name has a higher value than Title. Transform Lock: Enabling this means the item it locked on the canvas and cannot be moved or scaled by your customer. However on the admin side, you can still move or scale it. But once loaded in the product page, it is locked down. Edit Lock: Similar to Transform Lock above, this means users cannot edit it, if it's a text. Hide Context Menu: When enabled, the context menu that shows options for this element will not be displayed during customization by the customer. Is Reference: This is enabled for items that are not necessarily part of the design but you want to use as a guide. Any item which is reference is NOT printed in the final PDF nor displayed in the design preview. You can use this to create elements that show information or as labels. This can be image, shape or text. You obviously should lock this as well so it is not clicked and edited. At anytime, you can click the PDF Icon on the top right hand corner to generate a PDF and see how your design will come out.